The book contains important articles dealing with special ways to work with paper as an art form, as well as accounts of old papermaking that still exist today in remote parts of the world. The text and photos represent special programs sponsored by Carriage House Paperin 1985. Topics covered by various well-known papermakers/artists including "Shrinkage to Expand", by Winifred Lutz, emphasizing the development of 3-d form in paper, and dramatic color changes, using high shrinkage pulp; "Permanency in Paper Art" by Elaine Koretsky; Beaters and Beating by David Reina and Helmut Becker; interaction of Pigments & Additives and additives to create dynamic effects in paper art, by Donna Koretsky. 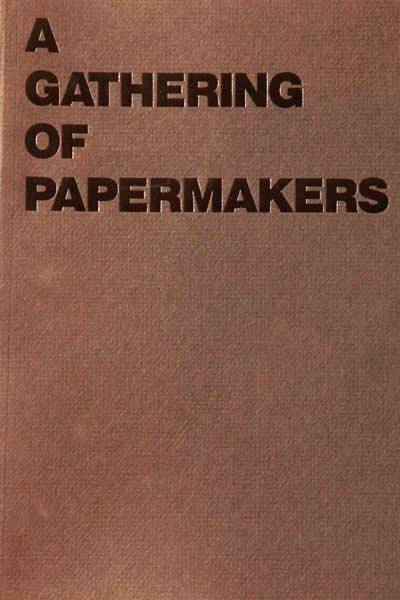 A Gathering of Papermakers contains 83 pages, with 64 photos.